The 3xD Simulator is equipped with 8 high-resolution projectors that can throw images around the 360-degree screen to try and trick a car's autonomous driving sensors. But how do you test for extremely rare scenarios? One answer is to use computer simulation. The day before Musk’s announcement, Jaguar Land Rover CEO Ralf Speth unveiled a new simulator in the UK that promised to remove much of the risk associated with the testing and early adoption of autonomous cars. 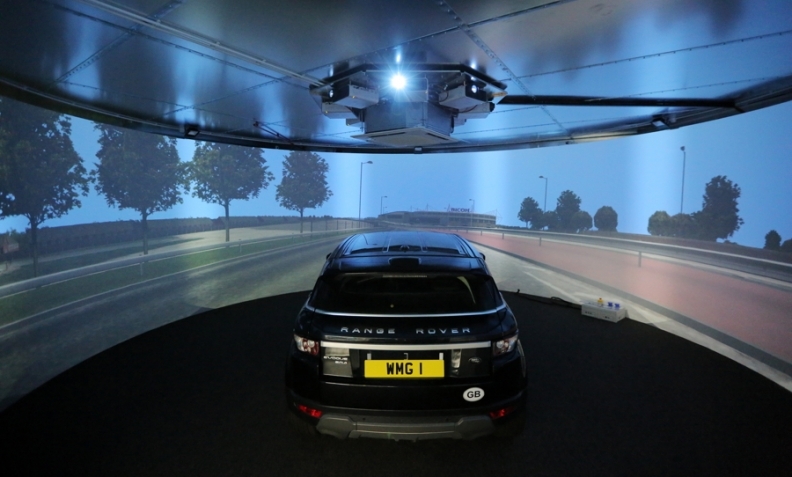 The 3xD Simulator is a 2 million pound ($2.6 million) cylindrical room built within a JLR-backed research facility in central England and equipped with eight high-resolution projectors. The projectors can throw images around the 360-degree screen to try and trick the different sensors in any car that is being tested. Simulation is especially useful in northern European countries such as the UK, where the weather is extremely unpredictable. How do you test the reactions of autonomous sensors when driving into the sun? “In the UK you can’t turn the sun on,” said the WMG’s head of intelligent vehicles, Paul Jennings. With the simulator engineers can program a 100 dazzling sunrises and sunsets a day. The simulator room has mobile phone coverage and WiFi to test all kinds of smart technologies, including what happens to connection-dependent systems when coverage is suddenly cut. Using the simulator, I tested the Range Rover Evoque’s autonomous systems over a 30-mile (about 50km) loop of the nearby city of Coventry. It’s impressive to see the town’s 1930s semi-detached houses still visible in the mirrors after you have passed them. WMG plans to add a second simulator that will let allow a car to be placed on a six-legged motion platform. The aim is to trick drivers into behaving exactly as they would in the real world. WMG is also involved with various real-world autonomous driving trials around the UK. None are particularly big, but the data and scenarios they introduce will be extremely useful for the simulator. “If anything interesting happens in the real world then we can re-create that here,” Jennings said. The simulator is open to all but the biggest customer will be JLR, a company that’s already aggressively pushing the digital side of car development. “It will give them a commercial advantage so that they will move that technology onto the vehicles as quickly as possible,” Jennings said. Hopefully all those “extremely rare” weather scenarios will be properly tested before another tragedy occurs.